Carrying on now from Wednesday’s wip day I’m also wondering why I never got involved in FO Friday’s ? Bizarre but here I am, better late than never. After Wednesday I carried on with the cloth I was crocheting and is now complete! I stuck with it and apart from a few tiny ornaments this is just a toe dipping venture into crochet for me! This year I am determined to get to grips with my hooks and yarn and produce crocheted items. I’m also addicted to dishcloths and use them and gift them. My cousin requested some more after receiving a gift set fro me on moving into her new house ! I’m sure along the way I will have many questions and queries but hopefully it will be fun and will open up another area of craft that I’ve been wanting to get stuck into. Ah yes I suppose a picture of it now would be good lol. I used Lily’s Sugar N Cream (I love getting my hands on this and am pleased I’ve found a UK outlet so its only a hop skip and jump to me over here in Ireland) and I used a 5mm hook. For further FO Friday posts or to sign up check out Tami’s blog. 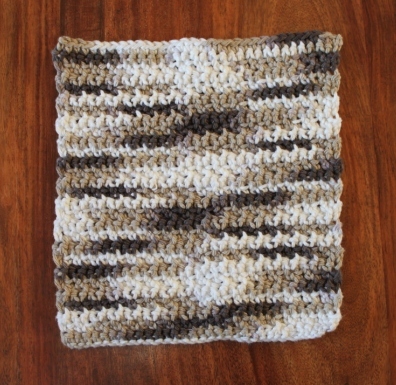 This entry was posted in Uncategorized and tagged Easy Crocheted Dishcloth.. Bookmark the permalink. Now aren't you glad you participated in FOF?? The dishcloth will be a favorite; I love mine and can't make enough! Nice job! Have fun with your new adventure!!! Welcome to Finished Object Friday. I only participate occasionally because I just can't seem to get something knit and finished every week :)Cute cloth. I haven't tried Lily Sugar N Cream yet. We mostly see Bernat Handicrafter cotton around here in Ontario Canada. lovely dishcloth, love knitted dish cloths! You're a great crocheter already! Look at you go! I have to get some of that yarn as I love the patterns it makes on your dishcloths and it did the same on your knitted ones! Too cool! Give all the little leprechauns a hug for me…your leprechauns that is….the REAL ones have been wreaking havoc with me this week! LOL! That is great, brown camouflage there. This would be perfect for a male recipient. You hooked a wonderful job on this. I wsh my Nana was still here, she was an amazing crocheter. I wold love to sit and be taught my her.